Remember to sign the sheet and lock your car! The hut water supply is from the black tank. It needs to be checked occasionally to ensure it is full. Just turn on the main tap, and let the hoses do the rest. Don’t leave the tap permanently on. Greetings ISSF shooters. Because I am not available on the 1st, & 3rd Sundays, there is a programme change for Trainees, non"B" cats, for March. Non 'B' cat training will be on the 2nd(10th), & 4th(24th), Sundays for March at 11.30am. Also of note is that there are 5 Sundays in March , so there will be a working bee on the 5th Sunday(31st), with priority given to sieving the brass cases, & clearing out the shed, & re-processing the stack of " coffin" style targets. We are also in the process of making our range more suitable for the police to train on. This involves a wall filled with sand erected at the back of the range,(loose tyres being moved to the left wall), & installation of posts for attaching the 25m shooting frames to, so they can be turned 90 degrees to open up the range. I have also ordered good cardboard 50m precision targets, & centres for the rapid fire targets. Because the evenings are getting darker the mid-week shoots will be limited to one Monday evening shoot on the 4th March, then discontinued. Sunday 31st: 10-30am Working Bee for all shooters! I am wanting to have a Graded Competition Event for our "B" cat shooters, on one of our designated Sundays, in the near future( probably now after the range modifications), but would want everybody there over a longer day, am & pm, so, could you think about it so we can come up with dates that you would be available, & we can have a discussion to decide a date suitable to everybody (or most). ​Thanks for all your help with R/Oing & participation in our events, Great to see your scores improving; concentrate on those sights!! As most of you know couriers will not transport powder any more, & we have to rely on a freight trucking firm to bring from Blenheim, after Steve's W/s transports across Cook Strait, & for personal delivery trips around the SI by Steve, delivered freight free. In the last week or so this ban by couriers has been extended by many of them( Fastway just yesterday) to primers and ammunition. There will be a freight truck transport delivery from Blenheim sometime in September, but freight costs, of course, are charged. I was quoted $40 for 3000 primers!! There will be a personal delivery trip by Steve's W/s in Nov/Dec, & I have made some pre- orders for this. A new item is the arrival of Hornady .22 Standard solid ammunition, to Steve's W/s, in Wellington sometime in Sept. This is loaded by CCI with CCI powder, but with Hornady projectiles. There is also a Subsonic H.P(100 pks). I have a delivery price for this ammo & have pre-ordered 10,000 solids & 1000 HP's( which, of course, I have to pay for). I have done this as, with the cost of freight from Blenheim, the falling NZ dollar, & that Steve's W/s will only be making probably 2 trips (if that), per year around the SI, getting .22 ammunition at a reasonable price will be very difficult, as will getting powder & primers (I have pre-ordered 5000 W-W Small Pistol). For those Pistol Club members who use .22 ammo, & are getting low on stock, I would recommend purchasing a brick of CCI now( I have 3 left), to get through to Nov/ Dec. Anybody wanting powder &/or primers or .22 HP's for the Nov/Dec delivery, please let me know. This coming Sunday 10th, both John (your immediate past President) and myself will have some of our Black Powder Firearms on range 1. If anyone is interested in Black Powder guns, you are most welcome . ​Also I must thank John H for stepping in and getting the Club Subscription invoices underway. While Robert is away. Something else has been brought to my attention and something to think about. In years way past the club had it’s own badge and cloth patch on caps. There has been some interest in doing this again. Let us know what you all think. My thoughts are; it give’s the Club identity, as most clubs have their own Badge, Patch. It may be chance to redesign, resize or keep as. Your ideas please. So me 60 newsletters are being sent out each month, and we have 51 members “on the books”. 59 reminder texts go out 4 times a month, with only one not having given me a cell phone number. This is quite a gain on last year. The average attendance each Sunday is just 15, about one third of our members. A reminder that if you shoot at another club please write it on the back of an attendance sheet. A change will be coming to the e-mail/txt system. Two competitions were run over the last year. A Cowboy Action / Wild Bunch shoot was held in December for “The Deep South”. This match, as just a “local club” event, was well attended by shooters from around the district. Unfortunately I only lasted until the middle of the first day. Thanks to Alec and Charles who attended to me. The Scouts were also accommodated, as were students from the Polytechnic. The Police also used our range over a period as part of their firearms training. They were very impressed with our facilities and would like to use them in future. (Discussions on this have yet to take place, a year from my last comment.) And of course, we held the recently completed South Island Cowboy Action Champs. Thank you to those that have assisted with the running of any of these events. We have supported shoots at Kaitangata, Dunedin (Misty Valley), Ashburton, Wanganui, and Hokitika. By supporting them, they support us when we run a shoot. The quantity of scraper-blades steel has been cut into targets of varying shapes and sizes, and more stands have been made to hold them. A set of smaller “poppers” has been made, and the large “poppers” re-engineered to fall forward. Range 1. The new gun stands were trialled at the CAS Champs, and need some modification. Range 2. Training courses are being held for all new members over their 6 month “probation”. While this appears to be working well, it needs to be written/documented to ensure that all new members cover all parts of the course. Range 3. The users still will need to ensure that ALL desks and targets etc are put away. Look ahead! Order (through Robert) patches/targets in plenty of time please. All disciplines are now looking after their own scoring system, reporting the results of their shoots directly to the new Newsletter Editor, Katrina. Thank you Katrina for taking over the newsletter, and starting to “impose” your style on it. Many thanks to Wayne K for running the training programme. The new (last year) Range Standing Orders assume that everybody has a Range Officer Qualification for the event that they are in. If you aren’t R.O. qualified or need a Holster Certificate – see Wayne. Please, if you come out to practice during the week (or even at the weekend! ), tidy up after you. Put targets away, rubbish in rubbish tins (take it home! ), and leave the range clear. Thanks also to Sec/Treasurer Robert who handles all the paperwork and the finances of the club. ​I note that from 15 years ago I was commenting on our membership of 20, and average attendance of 8. IPSC/Speed shoots had faded to none through lack of attendance/interest, and morning shoots were “unheard of”. 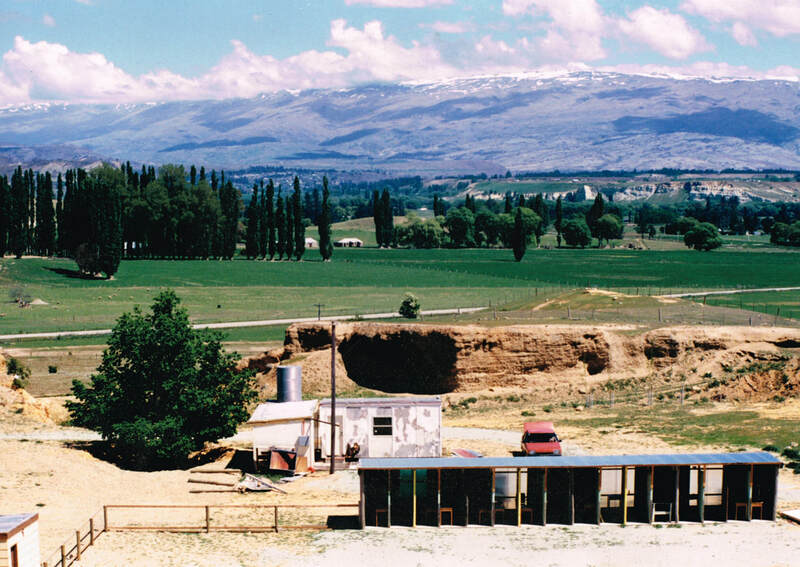 Wayne had introduced a Firearms Safety course at Cromwell Polytechnic and was bringing students to the range for practical work. Scouts were being introduced to pistol shooting, as too were members of the Caravan Assn, on various occasions. The range had been closed for several months to bring it up to the safety standard needed for Certification. This is when the tyre barriers and backstop were installed. No external competitions had occurred, and we weren’t running anything. 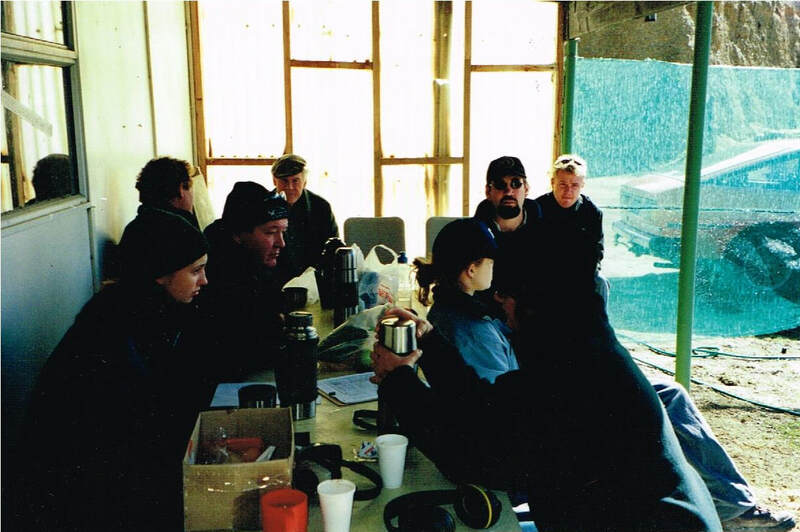 CAS was just getting underway in NZ, and it wouldn’t be for several years that we ran a competition. 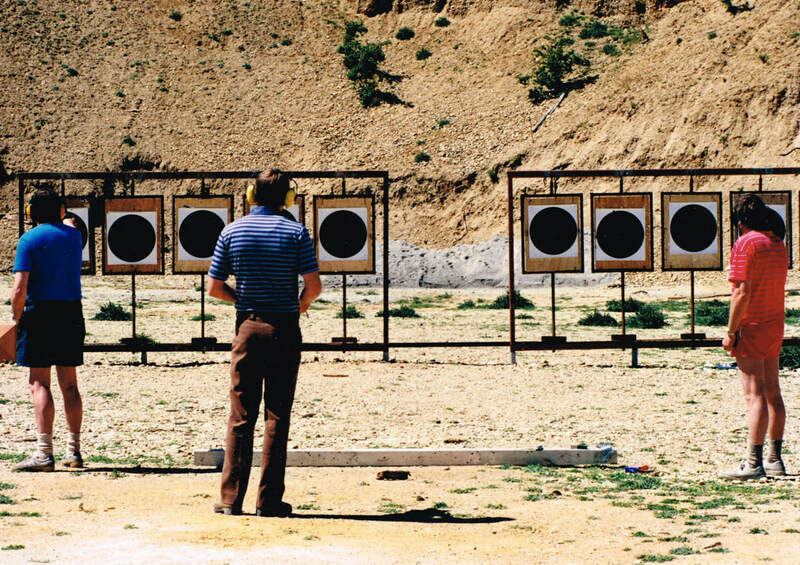 IPSC competitions have been very few over the last 20 years, and ISSF competition non-existent. 2005 saw the steel cladding go onto the clubhouse, the large window on the back of the shooting booth installed, and we ran our first CAS competition. 2006 we bought, thanks to Wattie, the generator. This saves about $1000 each year. Despite being told by the then Arms officer that we were only allowed 1 armourer, we increased the number to 3. 2007 the Warkworth PC visited after the Easter Bunny shoot for an action match. The number of .22’s available for club use increased by 2. 2009 after discussions with the Gun Club and the Box Factory, Range 3 construction was started. 2010 the white water tanks were acquired, we ran our first CAS SI Championships, Range 3 finished, we now pay the Gun Club $25 per member for the use of the ​grounds. Wayne, Secretary for 12 years, is replaced by Robert. 2011 membership is up to 30, postage killed the hardcopy newsletter and produced the e-mail newsletter. Many members attended RO courses in ISSF, IPSC, and CAS, first of the “Fireworks” sales. Many of us are going to shoots at other clubs. 2012 Text messages started. 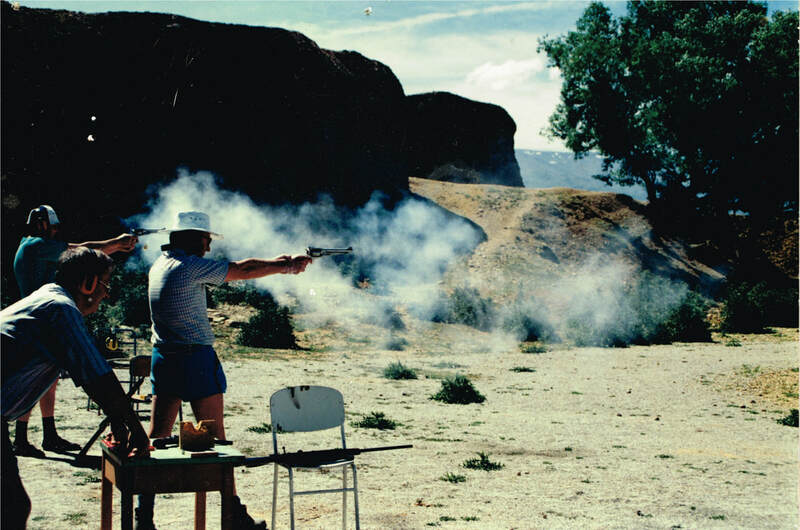 A Black Powder (CAS) shoot and a 3-gun shoot were held. The Range wall between R2 and R3 extended backwards, gate installed between R1 and R2. Long serving member Tony D passed away. 2013 more shooters are heading off to “outside” competition. Fireworks sales continue. 2014 CAS and 3-gun matches continue to be run. Range 3 is being developed as an IPSC range. The Club’s Constitution is updated. The Water system is given a shake up with “drinking” and “toilet” water supplies. The hut is wired properly to the generator. New BBQ area created. 2015 mobile Facades are created. The new Club Training Officer (Wayne) starts work. 2016 safety areas created on R1 and 2, and R3 hut installed. CAS shoots continue, as do members attending other club shoots. 2017 Jim J and Richard K die unexpectedly, membership is 42, Police use the range for training and wish to use it in future. BBQ deck area created, Range Inspection completed, “Traffic lights” for timing ISSF events running. It is good to see we have run several major CAS events, and “entertained” the Antique Arms Assn with several MSSA shoots. We have also run several smaller 3-gun events. There is no good reason why major events in ISSF or IPSC can’t be run here. We have the facilities, and proven catering ability.